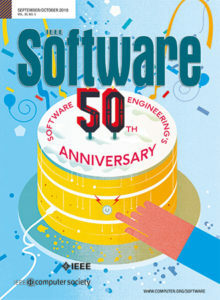 Neil Maiden, Editor of the Requirements column in IEEE Software, talks with Suzanne and James Robertson of the Atlantic Systems Guild about the emergence and impact of agile practices on requirements work. The interview begins with an exploration of how agile practices have changed requirements work. Suzanne and James introduce an important distinction between “Agile” and “agile”, then use it to drill down on how agile can address emerging important topics such as innovation. They close with thoughts about the future of requirements work in an agile world. IMO the weakest episode about Agile. Elementary material in a very mentoring style. I found this to be one of the best episode. The clear difference between agile and Agile coupled with a frank admission that Agile has gotten a lot of stuff wrong was refreshing. I believe the mentoring style was appropriate because rule following zealots have managed to make Agile into a process less agile than traditional waterfall by ‘it must be done this way’ and ‘we must follow the process’. A gentle, clear and firm explanation of why this is completely broken makes this podcast an invaluable digital asset. Great episode – I enjoyed looking at agile and Agile in a more philosophical way. I found this a provocative discussion, in which most cases I fully agreed with the comments made. As a discipline, “we” will continue to benefit from mentoring like this as long as sone big-A Agile teams don’t “get it” (or “grok” or otherwise grasp) that a “shared mental model” is crucial for all but only the smallest of software development efforts. Thank goodness on a more measured non-dogmatic approach to agile and highlights one of its weaknesses in its approach to requirements. * “Big A” agile – the approach to software development promoted by the agile manifesto and espoused by people like Ward Cunningham, Martin Fowler, Kent Beck, Bob Martin, etc..
* “Little a” agile – the varied, eclectic practices that descend from o intersect with “Big A” agile (e.g., Kanban, SCRUM, or some roll-your-own hybrid). * Degenerate agile – slavish adherence to selected agile practices without an understanding of their purposes and goals. For some reason, throughout this broadcast, James Robertson refers to degenerate agile practices as “Big A” agile, which is incomprehensible, misleading and dangerous. It’s likely to drive people away from “Big A” agile writers (Beck, Fowler, et. al.) – and those people are still the best guide (by far) to using software to create business value. I am a big fan of SE-Radio. This episode is one of the worst that SE-Radio produced. Is there any way, it can go back to the original produced and have no interference from IEEE? Could you be a little more specific please? What specifically didn’t you like? I found this to be a very balanced discussion of the topic. Although I am not the original author, I have to agree, that this episode is one of the weakest I have listened to, mainly because the speakers where discussing only the weaknesses of agile (with whatever writing of “a”) without realy outlining, what could and should be changed (except for some very commonplace suggestions). Therefore, the talk had -for me- basically no substance. The discussion involves mostly critical thinking. It is not easy to grasp. Providing solutions would actually go against the essence of the matter discussed. Basically, the speakers suggest that “big A” agile as all about following such recipes. Remember, Agile started by bashing waterfall, portraying it as a rigid doctrine. The speakers are advocating to avoid the same mistakes and remain critical about every methodology and process you are implementing. Because too often, Agile has been implemented like a machine, a series of steps for everyone to follow, instead of a methodology to define the processes that are best suited to a given environment. Indeed a disappointing episode. So requirements do not change, only our understanding of them does? The XP ideas came out of Webshops where the requirements *did* change regularly. You can blame the founders of those shops that they did not “think their business ideas through”, but that’s pointless: The very point of agility is responding to change as opposed to following a plan (remember the flickr story? so maybe the online game they originally planned to implement failed, but the photo sharing stuff did work out. Do you want to blame flickr for not “thinking the online gaming story through”?). And speaking of games: I wonder what the games industry (which is bigger than the film industry btw) will think of the comment that getting such a product right is much more trivial than getting “serious business software” right? We may or may not like the products of this industry, but as developers we should at least appreciate the fact that this industry makes some the most non-trivial software systems known to man (NASA and military stuff notwithstanding). Another point: “Agile does not address the problem space”. Well, of course not. The very point of agile is to minimize the boundary between problem space and solution space. That makes success depend much more on the people solving the problem, for better or worse. That said, it’s not that traditional methodologies have a good track record of improving our understanding of the problem space. Maybe that is because innovation is not enabled by processes. As a former colleague put it: Once a company starts hiring an “innovation manager” it’s high time to leave that place. I enjoyed this episode – it was challenging yet pleasantly presented. It was really enlightening to hear their statements about documentation as artifacts on the wall providing the “why” rationale, and code being the documentation of “how”. Tests often document ‘what’, but ideally should encode the “why”s in their messages and utility method names for posterity after the original artifacts are forgotten. Keeping the “why”s visible is the key to business success of most software projects, not just technical success (Kent Beck says “there’s no such thing” – it’s a euphemism for failure). Obviously this is the hard part of software engineering (not least because developers don’t always meet end-users), and most frustrating when adopting agile and finding it hard to slow down and think about how to make the code reflect layers of domain concepts and the tests reflect the reasons. It evidently takes years to get good at this, but it sounds worth it. @Jeff Sternal I agree. However I think James is focused on “A”gile of the past as it was unintentionally adopted by pressured and exploitative managers. “A”gile was always, as Suzanne says, “a terrific idea”. James rightly said focusing on speed is wrong and doesn’t “necessarily produce business value” – speed doesn’t have a directional component. Velocity on the other hand is about capacity to provide value, and doesn’t only span the narrow “A”gile realm of development – real “a”gile is about the whole value chain from gathering pure observation data all the way through to support and decommissioning, and realising value quicker by realising failure quicker. Ideally your first iterations are in the right direction, but even if you fail and change direction, your speed (purely magnitudinal) can independently help you estimate future velocity, assuming you released anything at all and your code is flexible and (to take the metaphor to the extreme) won’t increase ‘drag’ resistance over time. These scary assumptions are what make “a”gile practitioners promote /short iterations/ (duration not speed) for the ‘invisible’ development process /after features have been planned/. In his talks, Kent Beck makes no apologies for the /values/ of simplicity and feedback in Extreme Programming (XP) but honestly admits that his “A”gile /practices/ are only his current thoughts on how to achieve a steady flow of features – i.e. they are the baseline for a continuous improvement /process/. As well as being critised for being too “quick”, he is also unpopular for experimenting with small ‘slow’ iterations at the refactoring level. He finds it uncomfortable having someone watch over his shoulder, but he selflessly lets them. He’s done more than anyone to think, document and open up about his current practices so that others can do better. As another agile manifesto signatory, Jeff Sutherland also endorses the /values/, but clarifies that the continuous improvement process is where the power lies (“We /are uncovering/ better ways”…), not in any set of /practices/. James rightly says requirements don’t change, so agile is not about keeping up with business change. He’s addressing a common misunderstanding, not how Jeff actually sees it – it’s to drive business change forward as you fulfil requirements after fewer iterations (not one), and if you follow some sort of code review practice (not necessarily pairing or TDD), you can then fulfil new requirements with the same codebase if they arise. What’s unique about “a”gile is that after 7 years of honing, Jeff can demonstrate that XP and Scrum /practices/ within the Scrum /process/ are /already/ very effective because the continuous improvement process can give him that data! Back to documentation, James rightly says documenting “why” is important, but when he says you “need” up-front documentation for outsourcing providers I think he means you are currently forced to. However Jeff points out that outsourced teams in India and China are more and more becoming “a”gile, which James may not be aware of. I think Jeff Patton, in his QCon 2012 talk “Co-Making Great Products”, explains well that agile processes don’t ensure success, they just *explain* /current/ baseline practices which then *motivates* people and in turn facilitates *relationships* where /repeated/ failure is unlikely. In discussing User Experience design, he also gets at the same key issues (with examples) that the Robertsons call “systems thinking”: obtaining shared understanding, not just shared documents, through agile communication and discovery – making hypotheses about what will produce business value, telling and discussing user story maps with the customer and thus avoiding sub-optimising a development silo in your value chain.